Transporting your broken down or not road legal car has never been easier with To An Fro's beavertail hire for Exeter, Devon. At highly competitive prices you are able to easily move your new car following an internet purchase, even if it is in no state to drive it on the road or if it does not have the required documents, including road tax and insurance. 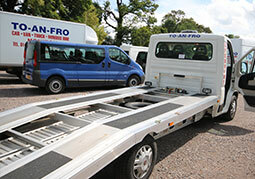 To An Fro pride themselves on provide a quality service, and with their beavertail hire they offer a driver to transport your new purchase so even if you do not have the correct licence you shall still be able to move your car simply and efficiently. As well as being ideal for those wanting to move their new purchase, To An Fro's beavertail hire is perfect for if you are wanting to move your broken down vehicle to a local garage to get repaired or back home where you can take a look at it yourself. If you are wanting to find out more about their recovery vehicle hire service then give their team a call today to find out more. 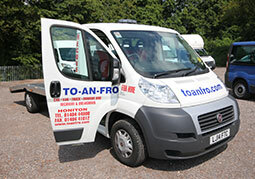 Bbased in Honiton, near Exeter, To AN Fro are in a prime location to provide quality vehicle hire.